8-Week, 6 day/week sport-specifically designed to prepare athletes for the fitness demands of the MARSOC Individual Training Course. Intense often 2x/day training program with high levels of volume and stress. 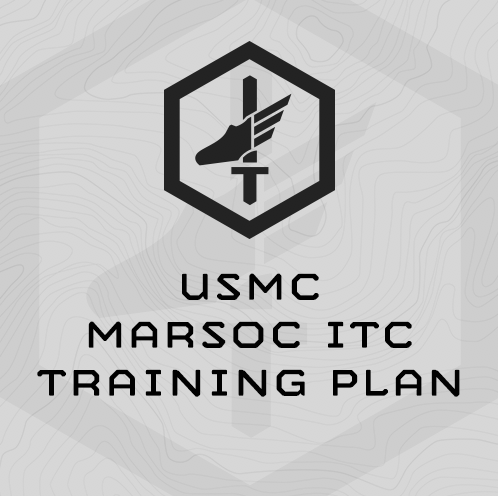 The following is a sport-specific 8-week program is specifically designed to prepare athletes for the MARSOC Individual Training Course (ITC) The plan includes a 1-week taper, and is designed to be completed the 8 weeks directly prior to your course start week. This is a very intense, 6-day a week program with high levels of volume and stress. Be safe and smart about your training as you work through the program and don’t be afraid to cut down sessions, or if necessary take an extra rest day if needed. This program gets progressively harder each week, until week 8, when the training tapers down into the start of selection. Don’t skip ahead!! The plan is designed to build upon itself. If you have to miss a training day, start up back where you left off. This is a 6 day/week training program… To successfully complete this program you’ll need to make training for selection a priority during your work day. This plan is “sport specific” to the specific fitness gates assessed at the onset of ITC as well full body preparation for the physical demands of the course. The gates listed below are assessed at ITC, and we have developed the sport specific programming for improved results on these tests. With the exception of the CFT, you will take all of these assessments three times during the course of this training plan, with percentage based progressions to automatically scale to your level of fitness. Building stamina and reslience is a key training goal of this plan, and physical and mental stamina is also key to completing the Selection course. If you can’t handle the training volume at first, its better to cut training sessions short, rather than take unscheduled rest days. Part 2 is not for time - we’ll build up to 1,500m fin before working to increase speed. Use this session to work on technique and familiarity with the fins. (3) 10 Rounds every 60 sec.